University of California Santa Cruz is often associated as a left-leaning campus and administration, being the keepers of The Grateful Dead Archive and located in a mainly undisturbed forested historic location, but they have raised the ire of this liberal blogger in the aftermath of a recent four day sit-in protest of a 32% increase in college fees enacted by the university. I personally side with the protestors, and the group leading the statewide protests called “Occupy California,” in that the increase is outrageously high and only serves to make higher education less available to lower and middle-income households. UC colleges across the state have spent huge amounts of money on construction projects but done nothing to improve affordability or increase teacher pay. I am well aware of the budgeting woes of the university that are not connected to administration decisions and believe this heavy of a rate increase and the response to the Kerr Hall Student Protest are examples in poor leadership above all else. If the spokesman had spoken with the protestors prior to speaking with the press he would not have spread what appears to be inaccurate information, and if the president had only come to find a method of negotiation with the protestors instead of simply ejecting them from the campus using the police department this incident might have been avoided. It appears the administration, though unlikely in a unanimous effort by any fashion, sought to simply throw these civil protestors off campus without even addressing them as concerned Americans because the protestors raised matters they would rather not address. Such attitudes of indifference to differing logic pang more of the “loyalty tests” we see coming from conservative-ideological camps than it does of liberal-ideological camps. I detect a desire to silence the facts of this matter, perhaps because it looks bad for the “image” of the university. 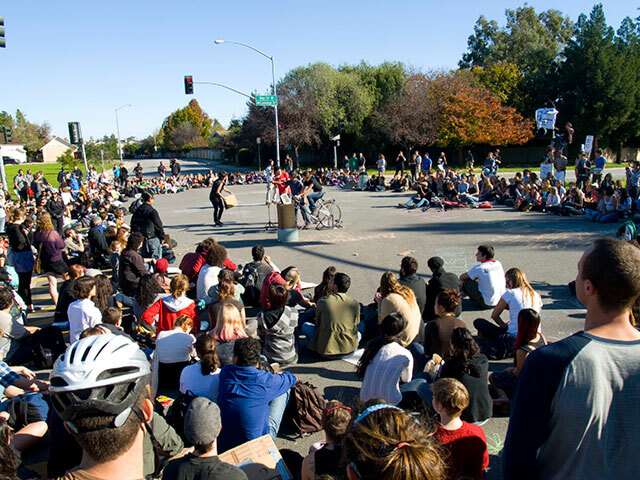 I am also willing to entertain this may have been a decision of the University of California administration as opposed to a decision of the UCSC administration to handle these protestors as such. 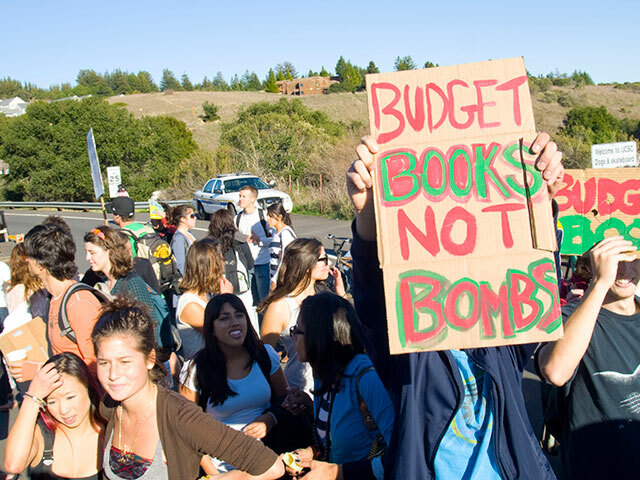 To make all these matters worse the local news-outlets are simply repeating statements of UCSC Spokesman Jim Burns, thereby I believe are under-reporting and outright altering the objective truth of the events surrounding the aftermath of this protest. Both The Santa Cruz Sentinel and The San Jose Mercury have notably deleted the online-versions of the articles they published on the matter. I do not have all the facts of the case, at this time, but it appears that either the Santa Cruz Police Department or the UCSC administration or both are guilty of greatly mishandling the matter of their response to a small number of destructive and misguided individuals who committed unclear amounts of property damage at UCSC’s Kerr Hall. One eyewitness told me that people were indeed being forcibly pushed out by the police of Kerr Hall, one website claims mace was used on students and a Letter to the Editor in the Sentinel claims that batons were used. I was working, I have been broke for way too long, but I probably would have missed it due to ignorance of it going on more than a lack of support. (I could have asked for the time off if I knew in advance.) Also I’m the “firecracker” in the crowd and might just have my pocket-Constitution handy since I’ll never be able to carry around that huge textbook o’ mine on U.S. Constitutional Law. (The Freedom of Speech shall not be infringed.) I should have been there on Saturday, no question, but I might have only gone as an objective observer. Had I attended the sit-in protest itself I would have been there on behalf of all American Workers, and on behalf of the working-poor and their equal right to higher education as the upper-classes. All while the UC system makes them the target of the budget gap that have in part created with speculative construction projects. Here is a notion: how about all UC administration officials take a statewide 25% pay cut? The difference that would make should be removed from the 32% fee increase and then that would be a policy I might support and would be more critical of those protesting such a hike in fees under such a circumstance. If the state is suffering and people are struggling perhaps the UC administrations around the state should consider putting themselves in a position in which they have to file for food stamps and are collecting their change to pay for gasoline to get to their job like the rest of us. To credit of The Santa Cruz Police Department they have recently formed a gang task force after myself and many others made voice to our concerns about the matter. I failed to give credit as that story broke to the SCPD after berating them over the matter via weblog. I believe this was simply a matter of a poor response, in this case, on behalf of the department to arrive with riot gear and non-lethal weaponry instead of standard equipment. The party that appears to hold the strongest share of what went wrong at Kerr Hall, is the UCSC administration, in both refusing to meet the protestors head-on and directly address their concerns and seek a peaceful solution to their vacation from the grounds if one exists and also in the case of publicly denying that protestors were asking to clean up the facilities that others had damaged if they were indeed ordered by law to leave grounds by means of their spokesman. Atop of that the university is claiming an unrealistically high damage cost for what multiple sources have told me was mostly minor damage caused by only a small numbers of irate individuals. It is my view, that if the administration had only addressed the protest from the lens of a civil rights matter they would not have made the same decisions. One thing I’ve learned, is that ordinary people don’t bend the truth and I believe these two testimonies over any of the “big-name” reporting to come out about this so far. No arrests were made and the demonstration ended without confrontation, UC officials said. I believe it to be inaccurate to say that the demonstration ended “without confrontation” only in that, according to my sources, approximately 75 people approached the police and offered to clean up the second floor. However, CBS5 is only repeating the statements of the UCSC Spokesman. It is accurate to say no arrests were made in Santa Cruz. -The protests at the UCSC campus are soon entering Day 4. -Additional students entering Kerr Hall to aid and support the occupiers. -Protest has remained peaceful and non-violent. -Dozens of students remain outside supporting those inside. – As of 1:20AM Sunday morning, supporters and occupiers are still present. The final component here is the political right-wing native to Santa Cruz and our local political dynamic perhaps effecting a great many views on this matter. I wouldn’t be surprised to discover many of the local police officers agreed with this position and such attitudes are not often found from reactions of law enforcement officials in regards to right-wing protests. The tuition increase along with the excessive spending on construction contracts while neglecting other more pressing matters like affordability were exactly what the sit-in was in protest of and this individual insists upon finding a way to blame the protestors for the highly questionable decisions made the UC that many, including myself, find upsetting. I long for a day when “tea-baggers” and neoconservative (“neocon”) pro-war protestors are treated with the same heavy-hands and greatly scorned just for the sake of expressing their ideals. I would love to serve some of these people the medicine of civil injustice and public harassment they so enjoy seeing done to any left-wing protest. I dream of an America that remembers the past of this country, endless disagreements of every nature and sort that we came together and sought solutions and found a way to look our neighbor in the eye even though we believed their politics to be nothing but whimsical rubbish. I believe far too many in this community would seek to blame the protestors themselves for all ills than ever look at the matter scientifically, or at least rationally. With all this love of the “expose,” I should really start tearing apart our local nut jobs and tell my tale of complete disillusionment with a prominent figure in local-conservatism. The true “expose” here is to be had on portions of the American Press, as well countless figures across the nation touting themselves as “objective” in politics when in fact they are nothing but the most bitter partisans you could hope to find who simply smile and laugh as they create an atmosphere of utter hatred for their fellow Americans. The people tearing apart our legislature, our political media, our newspapers and our economy in this state are not we the liberals and progressives of the state. I will continue to be critical of both sides and attempt to convey both sides of an issue, and then people can judge for themselves if any level of credibility should be bestowed upon people who distort facts to suit an agenda. Coming from any political persuasion, such actions are wrong. The population of students, alumni and residents here in Santa Cruz may be left-leaning individuals but I have long held the impression that the UCSC current administration is not that by any means and this possible suppression of what really happened when the sit-in protestors were asked to leave and the circumstances surrounding the dispersal. Not only would Jack Kerouac have had a weblog, but he would have been blogging on Open Salon. I feel that his writing techniques and contributions to Modern Literature are mirrored in the so-called “blogosphere” of today. I also feel that Open Salon is the only blogging-platform that is the home of artists of all stripes and the bastion of free expression in the mania of the web. I would never go so far as to say that this little weblog here, that you currently reading, is anything close to what Jack Kerouac might contribute artistically to the community. I only to seek to draw out that I am influenced, in part, by the same elements that influenced him to drive away from the cautious roads of standard-literature-procedure and drive boldly forth into the deeper forms of thought and real life observation. There is only so much I take away from Kerouac, as I have made more clear in bold. And to any thinking whatever I am doing is wise … This is not the case. I believe “edgy” is the term that keeps getting ascribed to the end result of this practice. That and getting banned from websites. So I invite everyone who already was live-journal blogging to keep doing your thing because this noise over here is usually taken as throwing firecrackers at people. Fair warning to the curious. There are endless possibilities within contemplation and creative expression. An infinite number of ways to view, reflect, express and ponder. But as to the confines of reacting to our environment there seem to be only three options. Only three choices. You wanted to go on a bike ride today. Unpredicted heavy rains have come to your area and are not expected to leave for several days. In a positive outlook, this is a chance to catch up on reading, housework or perhaps to spend time with friends and family. In a neutral outlook, this rain has no effect on your day and you may go ride your bike anyway or you may stay indoors due to the rain and both events are equally desirable to you. In a negative outlook, this rain has ruined your day and no matter what activity you engage in you will resent deeply that fact that you are not riding your bike. The ‘bike riding’ example is more or less what we most often from motivational speakers and self-help books. The concept that if you change your outlook on life you can attain happiness in your life now, instead of waiting for the perfect job or the perfect mate to fill that hole. I don’t fully subscribe to this logic. I see all people as first and foremost human beings. And human beings have all three of these reactionary options available to them no matter what choices they have made prior to this moment in time. I don’t condone negative and destructive behaviors, but I see them entirely human acts to commit. I don’t condone utter apathy and ignorance of your emotions, but I know most have strong and often private reasons for behaving as such. And finally I don’t support viewing all the world and your part in it as purely positive and affirming. We must strive for such a goal, must reach toward such heights without pause or question. But to believe we are not flawed nor perfectly capable of destruction and causing pain unto others is a flawed perspective. I see a lot of people using different words to describe the same thing. We are the source. We drew the line in the sand that says what is ‘right’ and what is ‘wrong.’ Whatever religious beliefs a person might have there is a serious need to recognize that negative elements in all societies such as greed, hatred, violence and slander are acts committed by human beings. My perspective allows no one to excuse their unkind and hostile behavior as acceptable in any way. I only seek to point out that all of us work within the same confines of human emotion and human irrationality. Rather than try to define our species as something it is not and never was, a perfect race. Huffington Post has the latest updates on the Iranian situation.